I find the this gray color scheme extremely difficult to read. It's also very hard to tell the difference between questions with answers and without. I am open to tweaking some of the parameters, but the greyscale is here to stay. All of the Oz sequences were filmed in three-strip Technicolor. The opening and closing credits, as well as the Kansas sequences, were both filmed in black and white and colored in a sepia tone. Publicity for the film mentioned the Technicolor but not the black-and-white or sepia, thus making it sound as if the entire film had been made in color. Sometimes color and sepia would be juxtaposed in the film within seconds of each other. At one point, Dorothy sees her Aunt Em on the Wicked Witch of the West's crystal ball; she is then replaced by a vision of the Witch. Aunt Em appears only in sepia-toned black-and-white, while the Witch appears in the crystal ball in full Technicolor. If your browser supports user-stylesheets, you can always use that to change things - StackOverflow's CSS classes are nice and clean, which really helps. Also, any StackOverflow styles on UserStyles.org should work fine on meta., since it's basically the same HTML.. Just change @-moz-document domain("stackoverflow.com") to @-moz-document domain("meta.stackoverflow.com") and all should be fine..
You need some color to let the eyes know where the focus should be. I am partially dyslexic and what helps is to see visually (usually with colors) where one thing ends and another begins. So the top bar to me seems mixed in with the rest of the site. Where on the other sites, it pops out and separates the top menu from the content. Same with the vote count box and the question title. You don't need much, a blue gray tone (#81819F for example) is more than enough. I've been using this userstyle style to keep the neutral theme and help me use the site. Jeff really didn't want to have this meta site, so it'll remain greyscale. Ok, Jeff, do the words contrast and readability tell you something? You have a transcript of your podcasts for the hearing-impaired. I am seeing-impaired but normally I have not to change my environment settings to read a page. Therefore could you please bring the colors or at least the contrast back? I like the color scheme. It treats the the meta site like a "shadow" of the real site. Very appropriate, imo. The gray-scale theme makes me think my monitor (or my eyes) are broken. What I want is the colors to be almost indistinguishable from grey. That would make the site a little less drab, but it would still convey that this is not like StackOverflow or ServerFault. I understand why the grey color scheme was chosen, it was to make it visually appear bland and nondescript, but that can still be done without removing all of the color. I'm a sometimes visitor to this site. Two things keep me away. Answered questions should be black with light gray numbers, unanswered questions should be a very light gray with black 0s, and questions with accepted answers should have black with white numbers. For me there is still a wee bit of color that they didn't totally kill. Normally, clicking on a question with an accepted answer shows that answer in gray. But if I click on my profile and select an accepted answer, it first shows up as gray then fades to green. Why is this site so drab? “View standard site” option for mobile devices? What is your opinion of the new tag “subscribers” tooltip? My answers don't get accepted - what can I do? 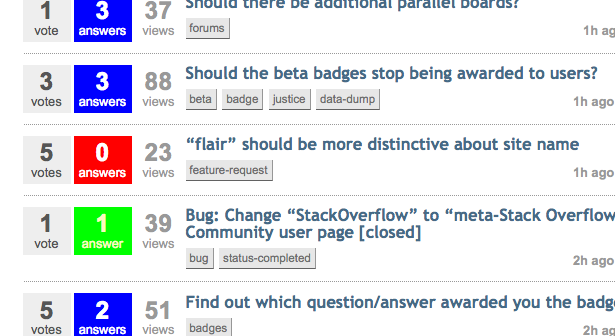 What is the most downvoted *accepted* answer in Stack Exchange history? Can we bring back the Gray bar?